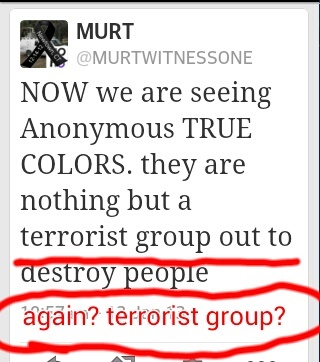 MURTWITNESSONE claims Anonymous are a bunch of terrorists NOT a hacktivists collective. or of resisting a government. Well MURT, since Anonymous is non violent, and you can’t produce fear by protesting, taking over websites or taking websites down I challenge you to find proof Anonymous is terroristic in any way. 1- No Anonymous linked person has been charged by the feds or local governments of any violent crimes. 2- If you’re defining Anonymous as an organization, prove it. Anonymous has said its an idea, not an actual organization. Lets look at the definition of “Anonymous” while we’re at it. So what exactly makes them terrorists?